This spring I had the opportunity to visit Las Vegas for a conference. Figured while I was there I’d hit the area a few days early and do one of my typical photo blitz tours of a couple areas I’d never been to before. So a friend and I met up with one of my other long time friends and fellow photographer, Monte Trumbull, and we logged some windshield time! Unfortunately the weather and conditions just didn’t cooperate at Death Valley. While I didn’t get any images, I still had a great time and got some good scouting in for future trips. We left Death Valley heading for Lake Tahoe. Drove out of the desert and into a full on snowstorm for two days. I love being in the mountains when it’s snowing! Early morning light on a beautiful and serene Emerald Bay on Lake Tahoe. 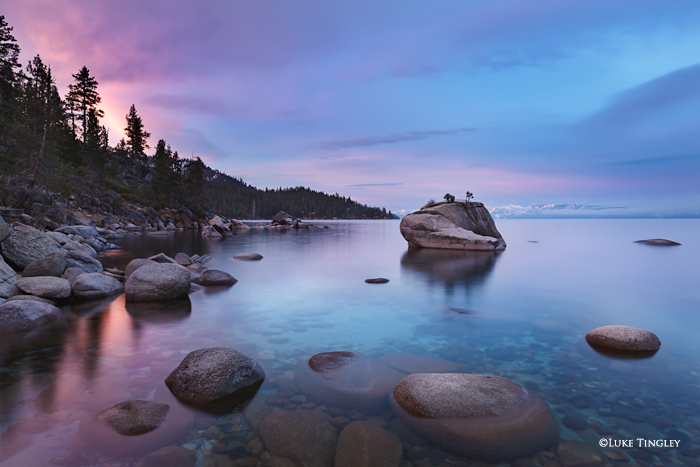 First light on the famous Bonsai Rock on Lake Tahoe. Funny (almost not so funny) trip note: Always make sure you have gas when you’re in the middle of nowhere! Heading into the mountains from Death Valley towards Lake Tahoe we encountered a full on snowstorm that was making blizzard conditions heading into the mountains. Pass closures forced us to make a detour. We coasted into a town (if you can call it that…) on vapors to the gas station that was on the GPS only to find out it was closed! Another small gas station in the town was out of gas because their fuel truck didn’t show up. The next town was 25 miles away. No way we would make it. Fortunately the owner sold us 5 gallons from his truck to the tune of $8 per gallon. Most expensive 5 gallons I’ve ever purchased, and worth every penny! Posted in Trip Reports on April 22, 2012 June 2, 2012 by Luke.